The Hover Pilder should need no introduction. 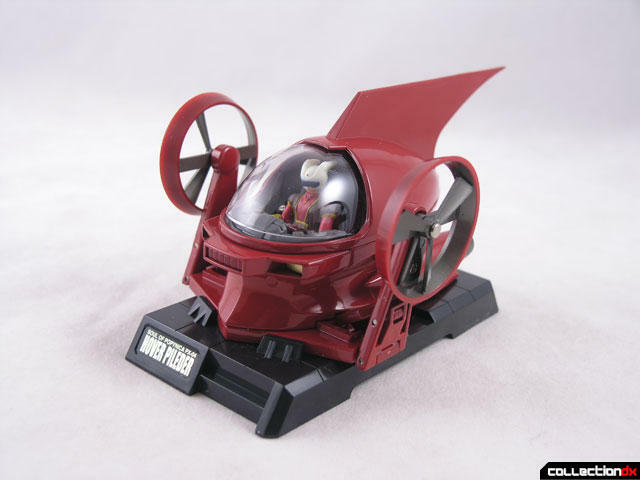 It is the small hovercraft that Koji Kabuto pilots into the head of Mazinger Z. What a "Pilder" is, I have no idea. 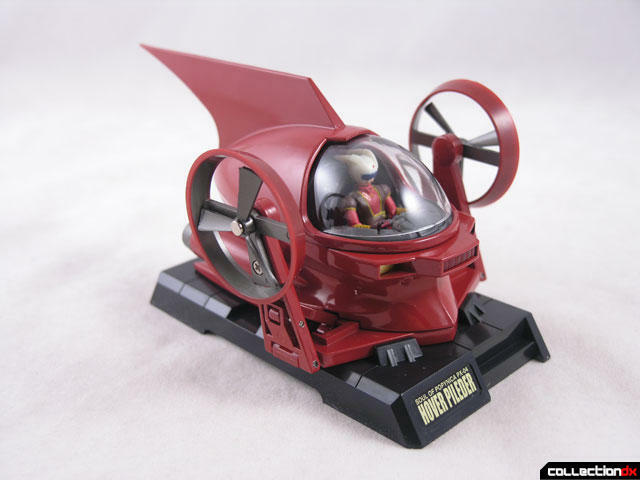 Bandai released a Hover Pilder as the first entry into its "Soul of Popynica" line (PX-01), way back in 2000. Now, NINE YEARS LATER, we are up to PX-04. So yeah, not a whole lot going on in the SOP line. To make matters worse, even though this is a different number release, it's basically the same toy. But since I passed on the first one, I thought I would check this one out. So why the new release? 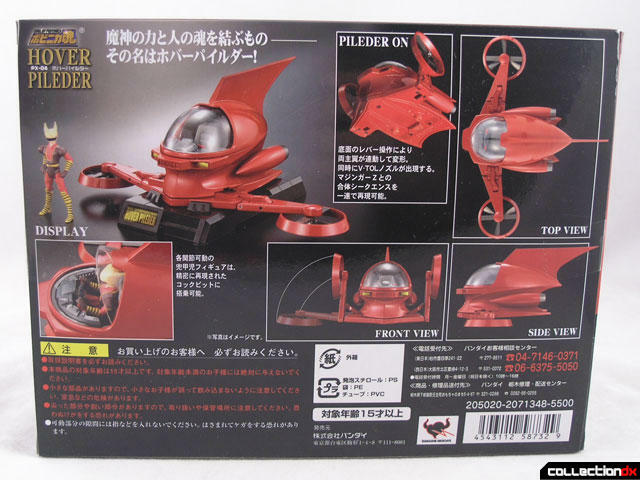 Well, this depicts the Hover Pilder as seen in the new Mazinger Anime series "Shin Mazinger Shougeki! Z hen". The new box is pretty, and inside is a welcome throwback - a styrofoam tray. There are no accessories and nothing to assemble. You get the Pilder, a small Koji Kabuto, and a stand. The Pilder is surprisingly small, and surprisingly heavy. The thing is nearly all metal. 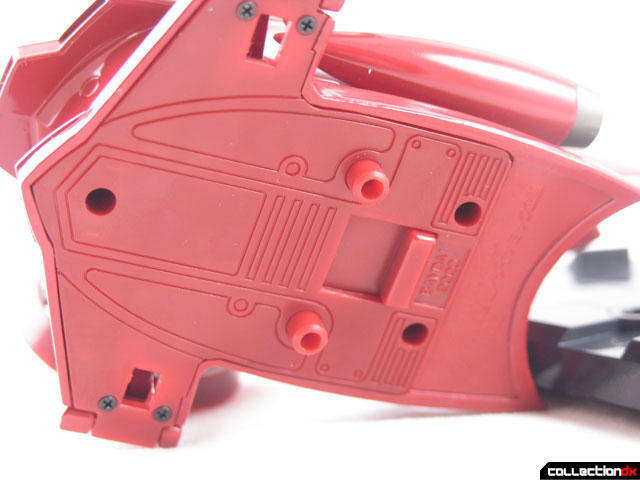 The tip of the central wing is so sharp that it ships with a protective cover that you need to remove. If all the metal goodness wasn't enough, there are actually a few gimmicks in there as well. First, the clear cockpit opens up to allow you to seat the mini figure inside. Unfortunately, the cover only opens about 3/4 of the way. 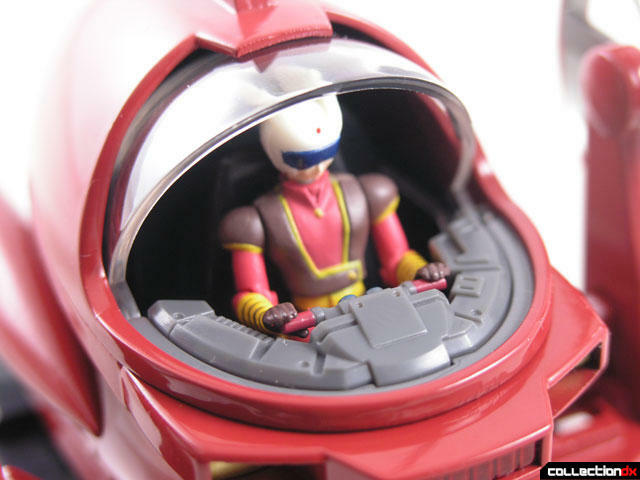 The cockpit is new for this release, and includes handles for the small Koji figure to hold on to. The other gimmick is of course the small foldable wings. If you flip the Pilder over you will notice a small lever. Push the lever back and the wings fold up, and two small pins come down. These pins help secure the Pilder to the base. Push the lever forward and the wings flip down again. It's a neat gimmick. At the end of each wing are fan blades, and if you blow air into them, they will spin. The base is nothing special, but it is configured to really sit the pilder in nice. The molded detail secures it well. The included Koji Kabuto figure is not that great. There's articulation for head, shoulders, elbows, knees and hips, but the glue holding the two parts of the torso together has failed, making it split in two on mine. I have not heard if this is widespread, but its worth keeping an eye out. Aside from the color and the cockpit molding - nothing else has changed. 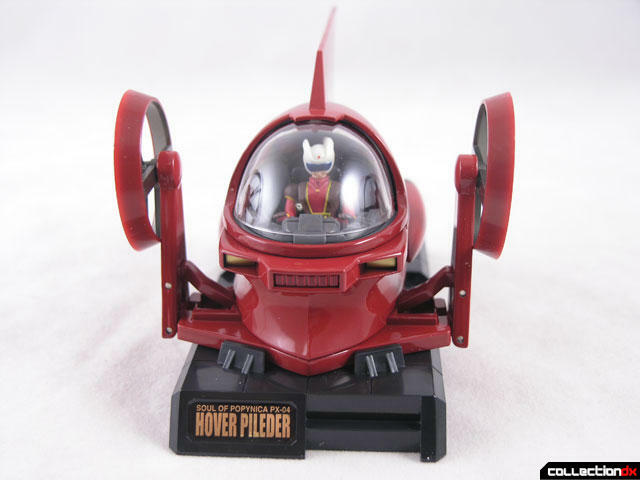 But if you missed getting a Hover pilder in 2000, this is a great opportunity to pick this new one up. I still prefer the PX-01, all these restylings show that Bandai has no respect for us collectors during the crunch... People like me have been waiting for Daltanious ever since the SOC series was launched... Where is it ??? 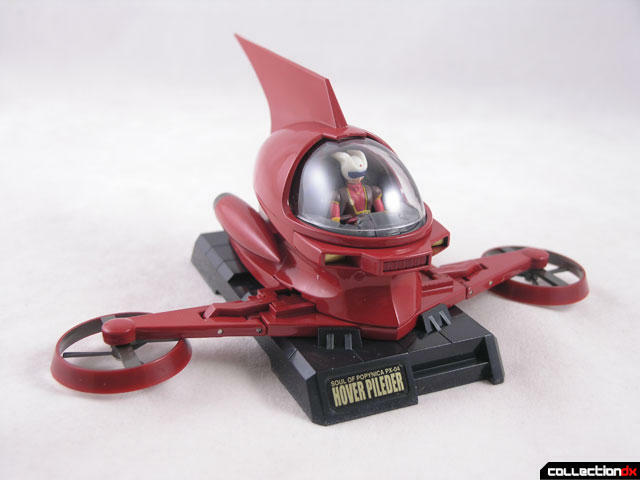 I guess nothing can surpass the original Hover Pileder. Nice to know that the Shin Mazinger Pileder has a new cockpit, not just a repaint. Wish I was able to get the Mazinger head to dock the Pileder when it first came out. I fully agree that nothing will ever surpass the original Pileder. However, I still cannot understand what the heck Bandai are doing! Why waste material on be@rbricks and other gadgets. 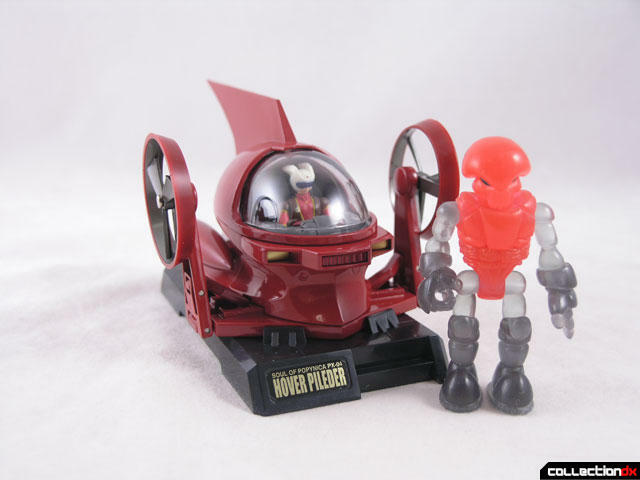 Why don't they give us a Jet Pileder, a Brain Condor + Great Mazinger Head, a Duke Buggy, a Mach Patrol, and the Getter Machines? Ya know... It is absolutely amazing to me that there is still no re-release of the goddamn head yet???! The price that they command is astounding (ALL PLASTIC!!!). Why Bandai cannot see this over the top demand for it I don't understand. I think that the re-release would outsell almost all of the others they have ever re-done. I thought I had one as a pre-order on ebay. It was $85.00. After a year of waiting, sadly my money was refunded.- Thanks Bandai! I have the first version of the Pileder. I do like the new cockpit. That was a much needed revamp. Great toy- nice, heavy - deadly. I wish Bandai would wake up and re-release the px-01x, as well as a new px offering: BRAIN CONDOR with GM HEAD!!! The pins help secure the Pilder to Mazinger's head as well. There is one detail that is bugging me, though - the colour!!! Although the Pilder is advertised as being red, mine turned out to be a very deep red almost purple!!! Is that a factory defect? Your feedback regarding this matter is more than welcome. That very same day I received it from HLJ, I opened the box, looked at the Pilder and put it back again, utterly disappointed not to say disgusted with what I had bought. 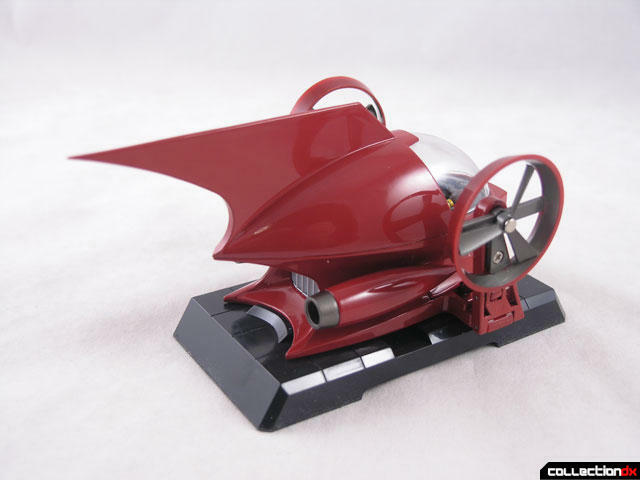 Nothing compares to the original Hover Pileder PX-01. It's not a defect - it's a very burgundy color, but that's how it is depicted in the new mazinger anime I think. I thought Bandai re-issued the original PX-01 and the Head, a couple years ago, and wasn't it also solicited as a set? I remember seeing these a few years back on BBTS and HLJ while i was ordering other stuff... now disappointed if it actually came out again. 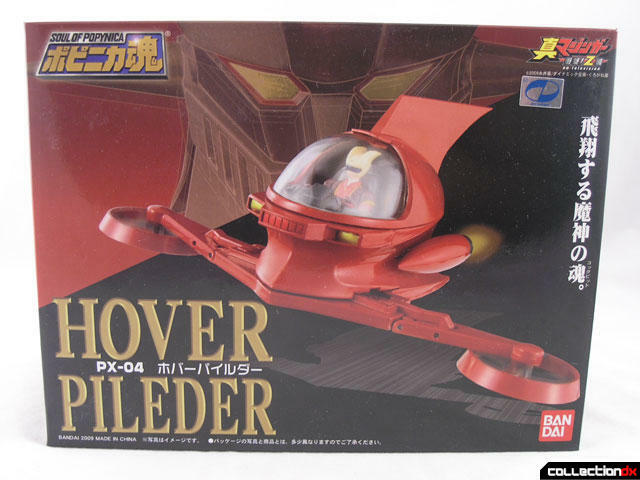 I saw both Hover Pileders on display at a local toy store, and the PX-04 is burgundy in shade. Great ideas for Bandai to re-release the Mazinger head, as well as hopefully producing a Jet Pileder, Brain Condor, Duke Fleed's buggy etc. Who can convince Bandai for us collectors? I still think the perfect SOC/Popynica would be an Eagle Fighter from Dancougar. It would be able to be display in all three modes including as Dancougar's head (with light up ups maybe). Of course the robot would be much more articulate than the tiny one that came with the SOC GX-13. I wish the display base for this thing looks like Mazinger Z's "crown" just to add a bit of realism, I guess?